When an ice maker breaks down or has a problem in its machinery, it is important to attain services of professional company like us. At Commercial Refrigeration Boston, we offer a vast range of services of repairing ice makers or to replace any part of it to make it works smoothly. 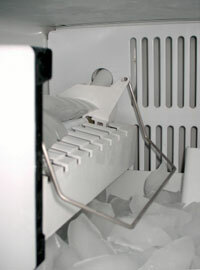 Our experts receive proper training and have access to repair any part of any ice maker brand. No matter which brand or model you have, we repair al ensuring guarantee and timely services. Whenever your ice maker get a problem like too few or small ice cubes, specs in the cubes, makes too much ice, makes very less ice, or no ice, ice taste bad, eject or any issue, you can contact us anytime. We offer services 24 hour a day and 7 days a week. Apart from this, we ensure that all the tools we used while mending the ice maker are best and assure quality services. While replacing any part, we ensure that it is original and offer stability and reliability for long. Regardless of the issue in your ice makers, we repair it, and then after checking it properly only then we hand over your icemaker to you. At Commercial Refrigeration Boston, we provide the best assistance along with the repair of your ice maker. We ensure that the ice maker work smoothly and that is why we only make use of latest technology tools. Our professionals carry out each and every process in a very systematic way and that is the main reason why we are a leading name of providing commercial refrigeration services at Boston. To attain our services, you can give us a call on (516) 299-6535 and we would be delighted to serve you with our best and high quality services.